← Do You Know Sheila Black? Do You Know Corrie & Jeff McPherson? 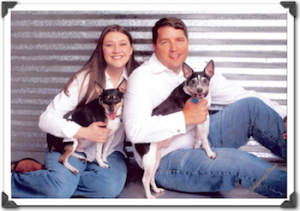 Jeff and Corrie moved to Lavaca earlier this year and love the neighborhood. Both are native Texans, but newcomers to San Antonio. Jeff was born in Stanton, Texas and spent his childhood years there, in Odessa, Laredo and ultimately Houston, where he graduated from high school. He then went to the Naval Academy in Annapolis Maryland and spent 5 years in the Navy (a year of which was spent in Japan). After the Navy, he moved to Dallas and worked for his father’s oil and gas company. At the same time, he went back to school and received a master’s degree in business from the University of Texas. He spent a couple of years working for a business and management consulting firm doing a lot of international traveling — mostly in Germany, Italy and London. When he was ready to spend less time abroad, he took a job back in Texas, and in 2010 he started his current business — Cactus Power & Light — with his brother. The business provides oil fields with large equipment (light towers, generators, pumps, trash trailers), serves clients in Texas, and is growing by leaps and bounds. Two years ago it was a two-man show (Jeff and his brother), and today they have five employees. Corrie was born and raised in Plainview, Texas. She went to Texas A&M, studied accounting, and graduated in 2000. She worked for several years in public accounting in Houston, and today she is a CPA and works for Clear Channel as the internal audit manager. That position involves significant travel, both in and out of the country. She’s usually on the road for two weeks a month. Since she started with Clear Channel about 9 months ago, she’s been to Brazil, London, Mexico, Canada, and to several US cities. Corrie and Jeff met in 2001, ‘over a pitcher of beer’ at a bar. They hung out together for the day, and they’ve been together ever since. They were married in 2004 in Rockwall, TX, which is a suburb of Dallas. Both are huge sports enthusiasts. They were at the recent Olympics in London and attended a swimming event, a soccer match, the men’s cycling road race, and beach volleyball. They are avid Texas Rangers fans and after two disappointing Octobers, they are hoping that ‘this is the year’. They also enjoy NASCAR and will be going to the Formula 1 Race in Austin in November. In addition to watching sports, they also collect sports memorabilia. They share their new home with Simon (aged 13), and Capone (aged 12) — the two adorable Fox Terriers pictured with them above. They love living in Lavaca and you may see them out and about on their “Fat Tire” bicycle (Fat Tire — the beer company — had a drawing for its 20th anniversary; Jeff and Corrie won and are now the proud owners of a genuine fat tire bicycle). Jeff’s company — Cactus Power & Light — is generously providing a large light tower and a generator for our National Night Out Block Party next week! So please say hello to Jeff and Corrie when you see them at the event, and thank them for their generous contribution! Originally published September 26, 2012, in the Lavaca & Friends Happy Hour update. This entry was posted in Do You Know...?, General, Lavaca & Friends, Neighbor Profiles. Bookmark the permalink.